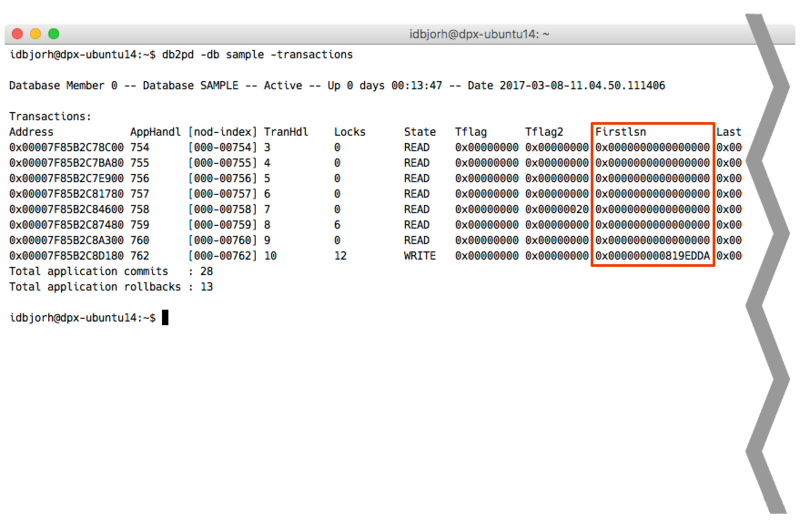 Some time ago, I wrote a post that suggested using the NUM_LOG_SPAN database configuration parameter to prevent long-running transactions from filling your transaction log. Using NUM_LOG_SPAN will indeed prevent the problem of long running transcations causing log file saturation, but what if you just want to find applications could become a problem, before the problem happens? Most DBAs will be familiar with the term “LSN”, which is an acronym for Log Sequence Number. An LSN is a 64-bit number, and is the byte offset from the start of the first transaction log associated with a database. DB2 reports LSNs in hexadecimal instead of decimal. The first transaction log, S0000000.LOG starts with the LSN of 0x0000000000000000. If LOGFILSIZ is 16384 (= 67,108,864 bytes), we can calculate that the first LSN in the next log file, S0000001.LOG will be 0x0000000004000000: This is the representation of 67,108,864 in hexadecimal. When a transaction is started, it is assigned the next available LSN in the database. The next available LSN is called the current LSN. When this LSN has been assigned to a transaction, it becomes known as that transaction’s first LSN. In an active database, the current LSN is constantly changing (increasing) as transactions are written to the log, but a specific transaction’s first LSN will never change. Incidentally, you may realize that (eventually) the LSNs for a database will be exhausted: The maximum possible LSN is 0xFFFFFFFFFFFFFFFF. When this eventually occurs, DB2 will put the database into read-only mode, and the only way to resolve this is to create a new database and move all data to it. (DB2 will start warning you when this is approaching by placing ADM1849C messages into the db2diag.log). How Many Log Files does a Transaction Span? The monitoring interfaces offer limited resources to help with this. 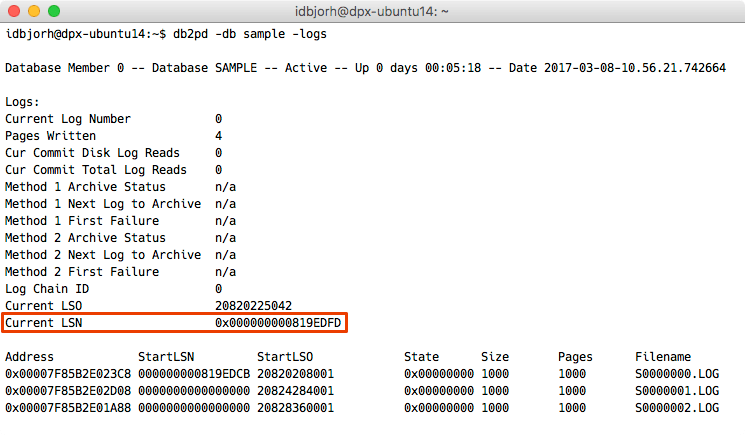 DB2 provides a monitor element, appl_id_oldest_xact that contains the application ID that has the oldest transaction in the database, which provides a useful starting point for finding the oldest transaction in a database. However, this element only returns a single application ID. If is more than one connection to the database with an old, uncommitted transaction, you won’t be able to determine this using any of the monitor elements in the database. You’ll notice that some applications will have a first LSN value of 0x0000000000000000; this is normal and means that the application does not have an active transaction – it last issued a COMMIT or ROLLBACK. # Find Current LSN. Using printf with awk converts the value from hex to decimal. Please note that db2pd may change its output format, so while this script was tested with DB2 9.7, 10.5 and 11.1, future changes to db2pd may break this script and require some modifications. The script as written above is of limited value – it provides some basic information. However, it could be enhanced to alert you if, for example, there are multiple transactions (not just the “oldest” transaction) are getting close to causing a problem. However, if you are using NUM_LOG_SPAN to prevent log file saturation as described in my earlier post, then this script may be more useful as a starting point to help keep track of the users or applications that are getting forced off the database. You could then follow up with the user(s) to make sure they understand what is causing their problem and can change their behavior to become better database citizens. Ian Bjorhovde is the principal consultant for DataProxy LLC in Phoenix, Arizona. He has worked in the IT industry for over 18 years and has spent the last 15 years as a consultant developing and supporting large DB2 LUW databases with clients in many different industries. He is an IBM Gold Consultant and IBM Champion, produces two DB2-focused podcasts called The Whole Package Cache and Create Database and has presented at many RUG, IDUG and IBM conferences. G8 article Ian, But seems its not working for AIX. Checking on that. Murali, can you provide some details? I tested this on AIX and it was working for me. Seems some problem with my shell I changed that and it worked, I confirm that its working. thank you for the article, It did clear all my doubts. Shenzu, you need to provide the database name to the script. So you’d execute the script as `./longquery.sh SAMPLE` (replace `SAMPLE` with the real name of your database). Hi Ian, it worked now, hehehe!! thanks a bunch. As we say it in Japanese, Domo Arigattou Gusaimasu!! always take care! !